I strongly feel we should strive now to honour and cherish the Earth during these times of vast environmental changes. People who understand these earth changes from a deep spiritual perspective are in my view our greatest assets. These are great souls who work in harmony with Earth on various levels (physical, mental, soul, spirit,). Below are some interesting worthwhile endeavours I’d like to draw your attention to. If you know of a sensitive thinker/meditator/service/product to which you would like a page dedication, please contact Earthwise. BUY YOUR HERBAL PRODUCTS HERE and help Ireland return to her emerald status! I hope to interview inspiring people who arein my view in harmony with the Earth. First author interview is with Harald Boehkle who wrote the Norwegian Pentagram. His story is so full of twists and surprise turns that alerted him to other dimensions he had not dreamt existed before he followed his nose and investigated Norway’s so-called Dark Age and the beginnings of Christianity. His book has a wide appeal though is little known outside of Norway yet. I believe that there must be new ways of engaging with the Earth in order to move with the new energies that are emerging. There are people in many walks of life who are aware of a deep connection to the Earth, and such people greatly assist the Earth on subtle levels though their sensitivity and recognition of the Earth as a whole being. We each find our own way of doing this. 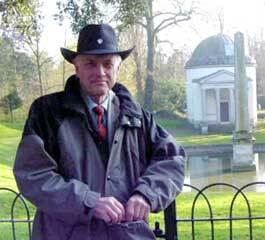 William Buehler in Chiswick House grounds. We are connected to the Earth, and so now as She inevitably evolves we can evolve in tandem with these subtle changes if we choose. I was very keen to interview a very humble soul William Buehler. He understands the nuts and bolts of how the Earth is undergoing such deep changes – changes that affect humans, regardless of their levels of awareness. His soul chose many lifetimes to assist with bringing in new cosmic energies that are anchored in the Earth. I have worked with William for many years and regard his knowledge to be of a very high vibration. He has genuinely helped orchestrate the shift in consciousness through his many hours of conducting Reshel synergy light work since 1975. For more information you can contact Edie his partner in loving service. For talks on how the process works, and on Metatronic ley lines, contact Jackie. In more recent years I came across the work of Marko Pogačnik who works as an earth healer and earth acupunturist. 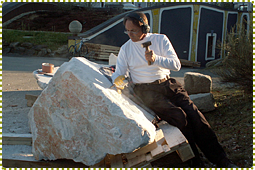 His skills at sculptoring stones are used in his healing work across the globe. I have had the good fortune of being able to accept his invitation to accompany him on his return visit to Northern Ireland where he is working on harmonizing the border, among other things.